The overall championship in the 2018 MATCH Series—and more than $100,000 in bonus money—will be decided on Saturday at Laurel Park. The track will host the three final races in the 25-race series: the grade III, $250,000 Frank J. De Francis Memorial Dash (3-Year-Olds and Up Sprint—Dirt Division), $100,000 Laurel Dash (3-Year-Olds and Up Sprint—Turf Division), and $100,000 Sensible Lady Turf Dash (Filly and Mare Sprint—Turf Division). The overall champion hinges on finish position and points. Sycamore Racing V's Jessica Krupnick has 34 points in the Filly and Mare Sprint—Dirt Division, which concluded Sept.15 at Parx Racing, and remains the target for the MATCH championship, which provides $50,000 to the owner and $25,000 to the trainer. Points are awarded as follows: 10 for first, 7 for second, 5 for third, 3 for fourth, 2 for fifth, and 1 for sixth through last. Horses making their fourth start in a division earn 5 bonus points, while those making a fifth start get an additional 2 bonus points for a total of 7. Trained by Damon Dilodovico at Laurel, Laki, a 5-year-old Maryland-bred gelding, will make his fifth start in the division in the De Francis Memorial Dash at six furlongs. Laki, who raced in the first four division legs (5 bonus points) and will earn an automatic 2 additional bonus points in the Dash, picked up 10 points when he was placed first upon the disqualification of Lewisfield in the Polynesian Stakes at Laurel in mid-August. Dilodovico, a winner of 670 races, also works full-time for International Sound at the Maryland racetracks. His wife, Christine, manages the stable staff with assistance from the couple's sons, Damon Jr. and Nicholas. Dilodovico isn't a stranger to the De Francis Memorial Dash. He trained million-dollar earner Immortal Eyes, a freaky-fast gelding who finished second in the Dash in 2011, third in 2012, and first in 2013 when the race was worth $350,000. 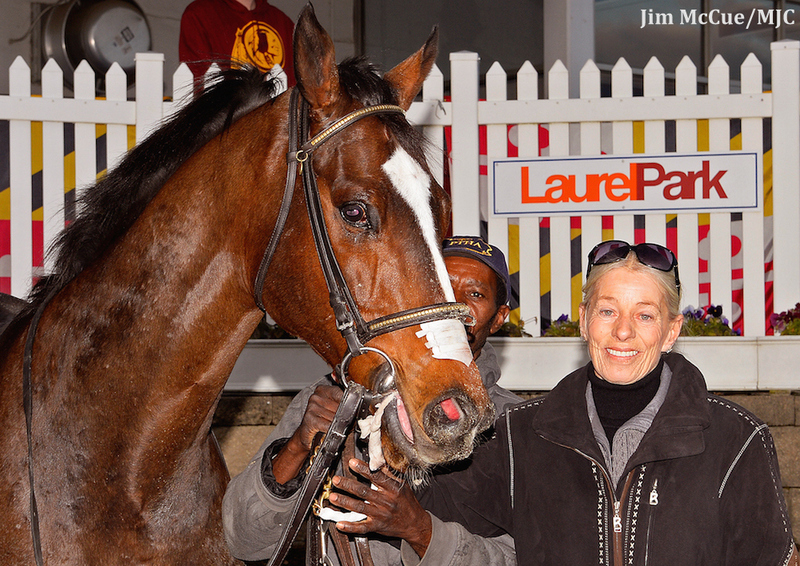 Pimlico Race Course-based trainer Mary Eppler already took the 3-Year-Olds and Up Long—Dirt Division with Adam Staple and Jalin Stable's 8-year-old gelding Page McKenney, who was retired several days before the fourth leg of the division. And she found out Sept. 19, by virtue of nominated horses that didn't enter the Laurel Dash, that she had won the division with another 8-year-old gelding, Oak Bluffs. Oak Bluffs, bred in New Jersey by Patricia Generazio, has raced in the first four legs of the 3-Year-Olds and Up Sprint—Turf Division, which means he would get 7 bonus points on top of points for finish position in the six-furlong Laurel Dash. He already has earned a $5,000 bonus for Generazio—owner of the top turf sprinter Pure Sensation—from the Thoroughbred Breeders Association of New Jersey for being the top colt or gelding New Jersey-bred by points in the MATCH Series. Eppler, who is closing in on 850 wins and has accumulated more than $20 million in earnings in her training career, said she saw upside with Oak Bluffs when she submitted the claim slip. Oak Bluffs, by Defrere, finished third in the Jim McKay Turf Sprint at Pimlico and then won the Pennsylvania Governor's Cup at Penn National as part of his MATCH Series run. The second and third horses in the division standings—Imprimis (20 points) and Pool Winner (19 points)—were nominated but not entered. Pool Winner, owned by Colts Neck Stable and trained by Alan Goldberg, has raced three times in the MATCH division so he qualifies for bonus money. He is currently second in the standings but Pewter Stable's Dubini, trained by Kathleen Demasi, has 12 points and will earn 5 bonus points for his fourth division start in the Laurel Dash plus any points based on finish position. After a victory in the restricted Not For Love Stakes at Laurel in March, the 4-year-old gelding finished third in the grade III Maryland Sprint Stakes at Pimlico and second in the Mr. Prospector Stakes at Monmouth Park to kick off the MATCH 3-Year-Olds and Up Sprint—Dirt Division. Runco said he believed Lewisfield deserved a shot in a graded stakes, so he passed on the third leg of the division to run in the grade II Belmont Sprint Championship Stakes in July. Lewisfield rejoined the MATCH Series in the Polynesian and, though he battled back gamely to have a nose in front of Laki at the finish, he was placed second for drifting out. The disqualification cost him 3 division points. As it turns out, the De Francis Dash will decide the division title between Lewisfield—he will earn 5 bonus points for his fourth start—and Laki, and perhaps the overall championship. Lewisfield also is in the running to win the $5,000 Maryland Horse Breeders Association bonus for top Maryland-bred colt or gelding by points. In the event of a tie for MATCH grand champion, the tie-breaker will be determined in the following order: Number of wins in the division, number of starts in the division, and number of second-place finishes in the division. This entry was posted in Racing and tagged Damon Dilodovico, frank j. de francis memorial dash, Jeff Runco, laki, laurel dash, laurel park, lewisfield, mary eppler, oak bluffs, page mckenney, sensible lady turf dash, The Match Series by MATCH Series Release. Bookmark the permalink.